Background: Misoprostol is a synthetic analog of prostaglandin-E1 and it is the most widely used drug for the medical management of incomplete abortion. Acute Coronary Syndrome (ACS) rarely occurs in perimenopausal women, in addition, its presentation is atypical, so the disease is not always recognized. Case Report: We describe a case of 39-year-old woman with no major underlying cardiovascular risk factors, who developed an episode of ACS following the administration of two doses of misoprostol. 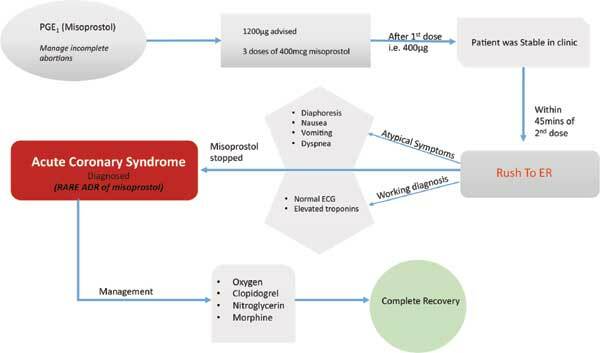 After the discontinuation of misoprostol treatment, there was a complete resolution of patient's symptoms. The case draws attention to a rare side effect of a commonly used drug and alerts the clinicians to be cautious in those patients having baseline risk factors which make the patient more susceptible to such serious adverse drug effect. Keywords: Acute coronary syndrome, misoprostol, prostaglandins, premenopausal women, adverse drug effect, TV-USG. Keywords:Acute coronary syndrome, misoprostol, prostaglandins, premenopausal women, adverse drug effect, TV-USG. Abstract:Background: Misoprostol is a synthetic analog of prostaglandin-E1 and it is the most widely used drug for the medical management of incomplete abortion. Acute Coronary Syndrome (ACS) rarely occurs in perimenopausal women, in addition, its presentation is atypical, so the disease is not always recognized.